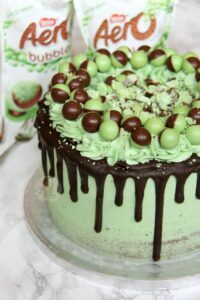 A Three Layer Chocolate Mint Sponge, with Mint Buttercream Frosting, Dark Chocolate Drip, and Mint Aero Bubbles Galore! 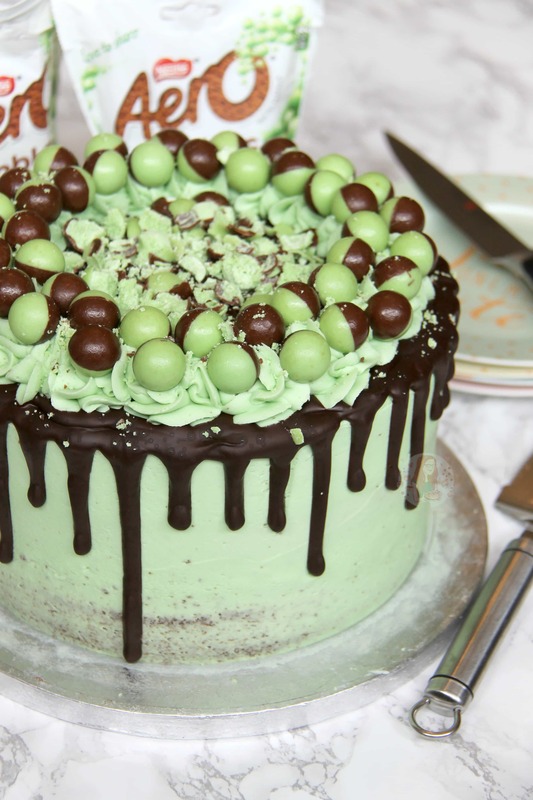 My favourite Mint Aero Cake! I decided to make this cake a showstopper of sorts, and go all out. Therefore, yes, the recipe is quite a lot of stuff. Technically, it does use 1.2kg of sugar, but if you think about it, its for a THREE LAYER cake with Buttercream inside, and outside, and on top. To get what I have achieved in the images, you do need all the ingredients. However, if you wanted to make a smaller version, check out my Tips and Ideas section below! I am lucky enough to have a bunch of lovely Taste Testers to eat all of my treats after I have taken my share, and this sort of cake always goes down well! I adore a drip cake, and oh my days they always get a good reaction on Social Media and with my Taste Testers alike. I just love the look of them! I also love making my Buttercream sliiiightly semi-naked style with it not being perfect on the sides. This is obviously, my personal choice, and partly down to me being far too lazy to make it perfect. My No-Bake Mint Aero Cheesecake, and Mint Aero Rocky Road have ALWAYS been popular, but I know all you Mint Aero lovers will adore this recipe as well. It’s quite sweet, which is why I use a Dark Chocolate Drip. You can use a Milk Chocolate Drip instead, but you will need less oil to make it drippy. I much prefer the almost bitterness of dark chocolate though as it cancels out some of the sweetness to my perfect level! Almost how salt in caramel does! I happened to bake my cake somewhere else, so when I was running back inside to photograph it, it got rained on so it does look a little odd in places… but it still tasted dandy! Honestly, I didn’t care about the rain drops. It still looks damn delicious in my eyes! Even with my little faults here and there, this sort of cake is easy to achieve if you relax about it. Using a Wilton Icing Smoother makes things s SO MUCH EASIER as it gives you the flat surface to run around the edge and make it smooth. 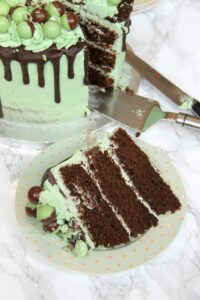 A Three Layer Chocolate Mint Sponge, with Mint Buttercream Frosting, Dark Chocolate Drip, and Mint Aero Bubbles Galore! 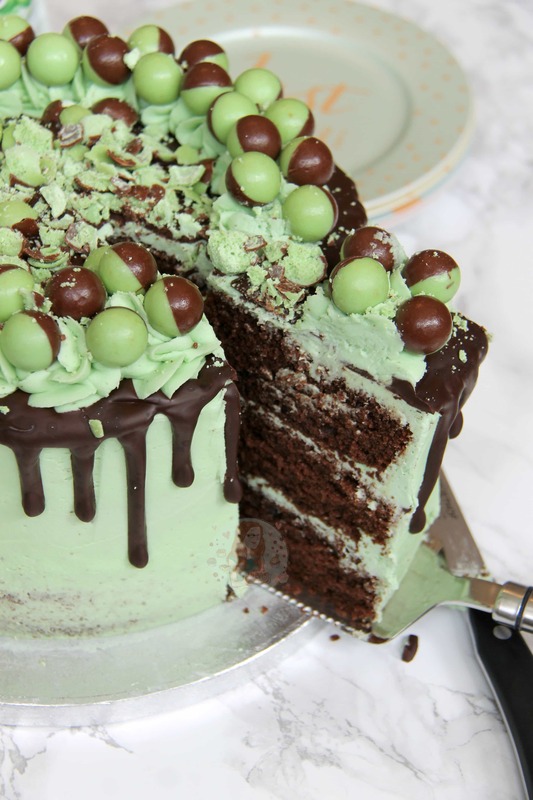 My favourite Mint Aero Cake! In a stand mixer, beat together the butter and light brown sugar until light and fluffy. Add in the flour, cocoa powder, eggs, baking powder, and mint extract and beat again briefly till combined – try not to overbeat. In a stand mixer, beat the butter with an electric mixer with the paddle attachment until it is smooth and loose and then beat in the icing sugar 1/3 at a time until its fully combined. Add in the green food colouring a little at a time till you get your desired colour, and the mint extract. Beat the buttercream for 4-5 minutes on a medium speed so it starts to get fluffier and lighter. – if its a bit stiff, add in 1tbsp of Boiling Water at a time till you get a smooth consistency. Once the cakes are cooled, put the first layer on the serving plate spread some of the buttercream onto the top of the first layer, add the second cake on top, and then top again with some of buttercream and then add the final sponge layer. Only use about 1-2 tbsp of buttercream per layer so that you have enough to decorate with! With the leftover buttercream, as you can see, I covered the sides (and top) too! 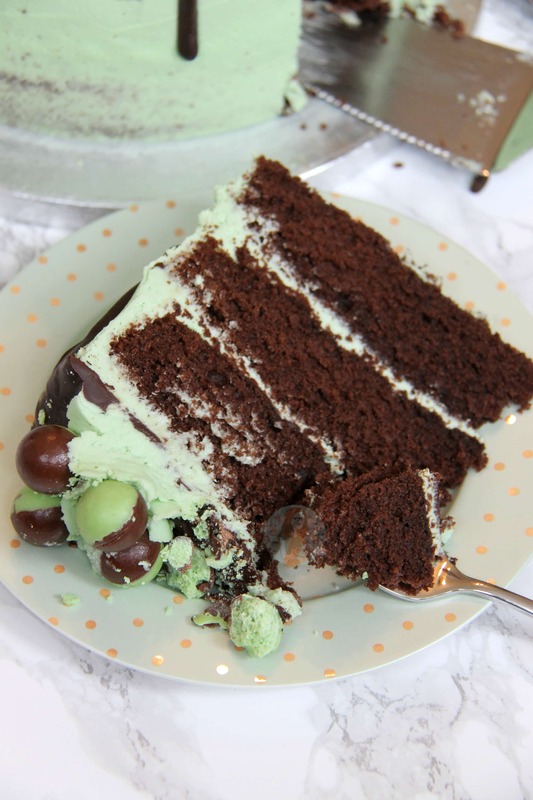 I tend to refrigerate my cake after step 6 to make this easier as the cake is so moist but this is optional – you could just slap it all on if you wished! Sometimes its best to do a thinner “crumb” layer and refrigerate it, and then do the thicker layer for the final finish! Once finished, make the chocolate drip – Melt the Dark Chocolate carefully until smooth. Add in a little sunflower oil at a time till you get a drippy consistency. I usually use 1.5-2tbsps of Sunflower Oil for Dark Chocolate. Gently pour/pipe the ganache around the edge of the cake to cause the drips, and pour the rest onto the top and spread evenly and leave to set briefly. 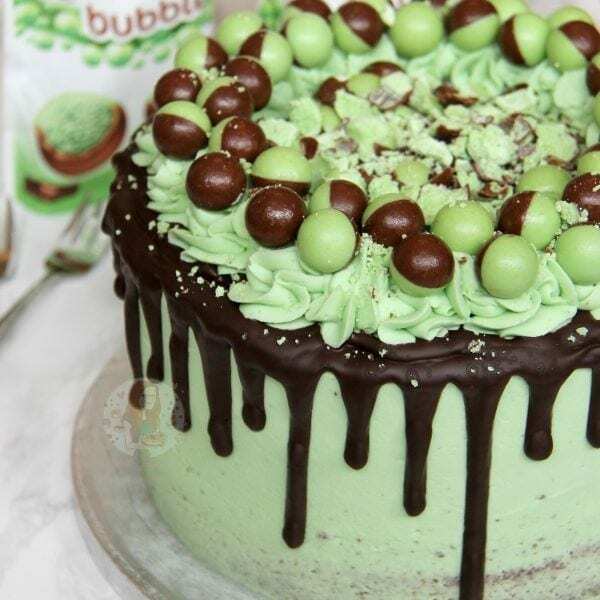 Once the chocolate has set, with any leftover frosting, pipe some little rosettes onto the top and COVER IN MINT AERO BUBBLES! Enjoy! You can use Ganache instead of the Oil method if you want by using 100g of Dark Chocolate and 100ml of Double Cream. Heat the 100ml of double cream until its just below boiling point, and pour over the finely chopped chocolate and leave for 5 minutes to just sit. After the 5 minutes, stir until smooth and leave it to cool for about 5 minutes and then drip away! It might take an extra 5-10 minutes to bake! Also, use 2/3 of the decoration recipe! This cake will last for 3 days at room temperature. Older Next post: White Chocolate and Strawberry Tart! Newer Previous post: Malteser Fudge! This looks amazing – I can smell the minty goodness through the screen. I want to give this a go but would you recommend using a 1/3 of this recipe and splitting into 2 7 inch tins. If not I can stick to the 8inch…more cake! Hiya! Do you mean the cake part? Is there a way of making this dairy free? Technically yes. As long as you use a dairy free baking spread in the sponges, it should be fine. Most cocoa powders are dairy free but you would have to check that. The only thing is dairy free baking spread isn’t the best for stiff buttercream, so it might be too sloppy to put on the sides of the cake, but its worth a try. 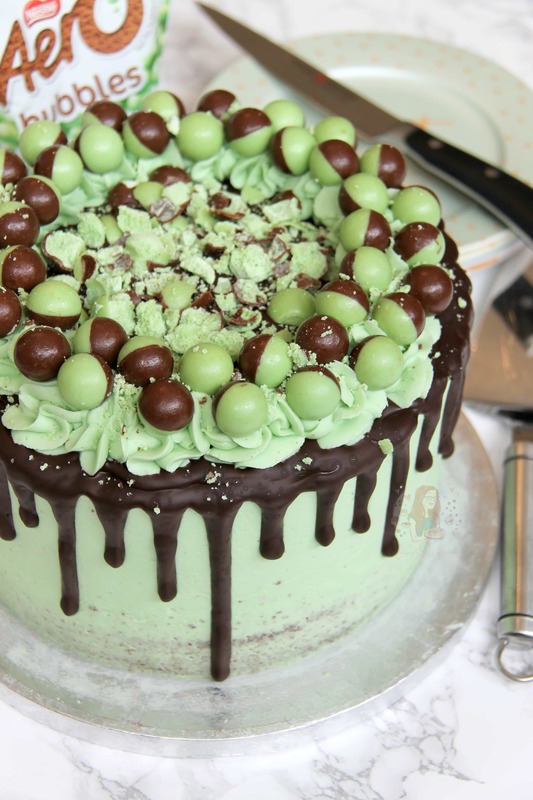 I am making a gluten free version of this for my twins 8th birthday. My daughter has coeliac disease. Fingers crossed it tastes ok. It certainly smells nice! I’d like to make this for my son’s space themed birthday party. Any ideas on modifying the decoration to make it look like an Alien? All I can come up with is putting white marshmallows on sticks with a dab of chocolate to make googley eyes! Help! Hiya! How alien like do you want it to be? You could try decorations on top, or try using rice Krispy cake mixtures to make aliens and covering them in chocolate for example? It’s worth having a google to find better stuff as my ideas are lacking haha! How can I convert this recipe into a two layer cake ? It’s not for the amount of cake you’re making 👍 you do definitely need 8 medium eggs. Made this cake for a family celebration, it looked and tasted amazing everyone loved it. Thank you. Can I use milk chocolate and sunflower oil for the drip? Or is there a specific reason why is dark chocolate? So excited to try this cake for my partners birthday as he is a mint aero addict! Just wanted to check with the smaller version how many sponges would that make or is it 3 still but smaller tins? I’m making this cake right now, the cake is cooling, quick question. What does the sunflower oil do to the dark chocolate? It thins it out to make it drip easier – and keeps it softer so when cutting it doesn’t break. I’ve never tried it but I don’t see why not! Oh my god, I swear I can smell how lovely and chocolatey and minty this is!